As the oldest manufacturer of climbing equipment in existence today, Grivel built their reputation on making innovative, dependable equipment for the dedicated alpinist. I purchased a set of alloy Tech Machines at full MSRP for my own use in spring 2016, after running through two pairs of wobbly heads from another brands’ best selling technical axes. I abused the Tech Machines throughout the 2016-17 season. They come in at a respectable 635gr, which puts them right in the range of comparable tools (Petzl Nomic – 605gr, Black Diamond Fuel – 638gr, Cassin X-Dream 600gr). The offset handle design provides a stable upper grip for matching. The steeply angled shaft provides ample clearance for hooking in featured ice, and sets the pick securely in small rock holds. My Tech Machines experienced a wide variety of conditions and grades throughout the Canadian Rockies (2016-2017). Moderate alpine outings, rambling ice, steep vertical ice pillars, and up to M10+ drytooling. [Maarten] My Tech Machines got used on both steep ice and mixed lines whilst in Quebec and several steeper alpine climbs in the Canadian Rockies. These things are tough, and should be on your radar as a dependable mixed climbing tool. The Tech Machines drytool better than Nomics due to pick angle and stock pick points. 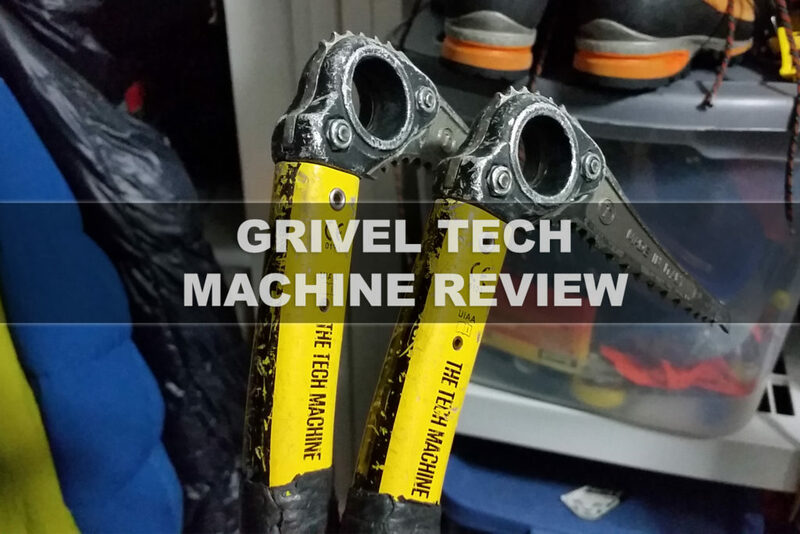 Overall, the Tech Machines required less pick maintenance throughout the season than Petzl. The tough forged picks require serious effort to file, but I only touched them twice all season. Pinging a picks off rock behind thin is ice no longer as tragic with these picks. I obsess over performance, and touching up picks after every outing is a chore. These picks appeal to the OCD performance pick filer and tuner in me. I rarely have to touch them, and stock picks require no modification. The secondary handle has a nice high offset, allowing for extra height when matching, and extends reach in a figure four move. The Tech Machine has a charming brutish quality typical of Grivel tools, and a neutral swing somewhere between the BD hammer swing, and Quantum Tech flick. It is similar to the Petzl Nomic, but heavier. I always ran pick weights PLUS hammers on Nomics for regular fat ice, so I like it. Pick angle is more aggressive than Nomics, so they work great on steep ice. The super sharp, tapered ice picks are confidence inspiring on thin ice, and sketchy rock moves. You will need to find the “ice plus” or the mixed picks if you want to run hammers. The hammers are excellent, and the long standoff from the shaft and large hammering surface are nice features on a tech tool. The picks can bounce if not kept sharp, due to the steeper angle of the pick compared to other brand tech tools. Brand new picks are sticky and can be difficult to clean if you habitually overdrive placements in good ice. The stickiness improved with time, and I suspect a de-tune would improve pure ice performance on new picks. These downsides, however, contribute to the tool’s strengths on on steep rock and thin ice. Upper grip matching induces a bit of pick shift on steep ground, comparable to X-Dreams. The weight and swing will not be enjoyed by the wrist flickers or gram counters. It’s not as much of a beast as the old Fusions, but if you swear by Nomics without pick weights, these would not be your tools. If you have wider hands, try the handle with gloves before committing to a pair. I have wide hands, and the fit is snug but acceptable with the heaviest gloves I would ever lead in. This tool can carry you through all the water ice grades, and upwards into the realm of technical mixed climbing. Just like any other tech tool, Tech Machines excel in vertical terrain and mixed climbing, whereas a tool like the North Machines will win out in easier terrain or the alpine. An adjustable handle would win over additional customers, while compromising the simplicity of the current grip. They have been dropped in steep caves, and been subjected to extreme reverse loading while drytooling. They have hammered some pitons with great effect, but in general I try to do this with a real hammer these days even on steep terrain. I am very impressed with the durability so far.